One of the most popular heavy duty trucks in Turkey, a Karoser Sanayi is a familiar site heading down city and country streets, though many may not be familiar with the name brand. Similarly to trucks in the United States, this durable, heavy-duty truck wears many hats: as a transport vehicle, a dump truck, a loader, a hauler, and much more. Like other similar trucks its size, a the Karoser Sanasyi vehicle alternator that comes with the vehicle is a stock, heavy-duty alternator. For its many purposes, this heavy duty vehicle must sit at idle for long periods of time, requiring a lot of electrical power. The heavy duty alternator that comes installed on this truck has a high output, which is helpful, but at the cost of a high RPM. Switching to an Eco-Tech alternator is a smart move. 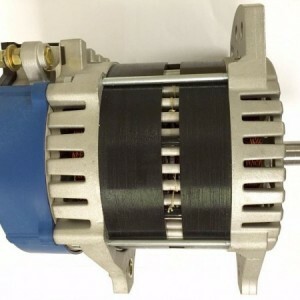 For example, an Eco-Tech alternator can give you 260 Amperes of power, but at a mere 1,800 RPM. The stock Karoser Sanayi vehicle alternator would require 2,000 RPM plus, for the same output. This, in turn, saves you on wear and tear of the engine, the alternator itself, and the battery. Making the switch to Eco-Tech also negates the need to install special equipment to satisfy the electrical load, such as a high idle or load shedding device, or multiple battery packs. Lastly, switching to Eco-Tech saves you on gas. An improvement in fuel economy is seen every time someone replaces a stock, heavy-duty alternator with an Eco-Tech ones. With a reduction of engine drag of 50 percent, the choice is simple – switching to Eco-Tech is the most economical decision.